If you haven’t tried zucchini “noodles” yet, I urge you to give it a try. They are easy to make by simply shaving a zucchini or squash with a vegetable peeler and then lightly sauteing the ribbons in a small amount of butter or oil. 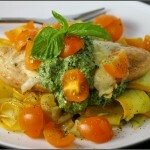 This kale pesto has an illusion of indulgence – it tastes great but is low calorie and low fat. With the addition of a vegetarian chicken cutlet, fontina cheese, and halved cherry tomatoes this entree comes in at just over 300 calories per serving. Served on it’s own, the zucchini and the sauce are under 200. Shaved zucchini makes an awesome and healthy substitution for regular pasta. Place pesto ingredients in food processor and pulse until well combined and no large pieces of pecan remain. Transfer to a bowl and set aside. Put cream sauce ingredients in food processor (no need to clean it out from before) and pulse until smooth. Transfer the pesto back into the food processor and pulse a few more times until blended with the cream sauce. Melt butter in a nonstick skillet on medium heat. Add zucchini ribbons to hot butter, toss to coat, and cook until soft but not mushy. 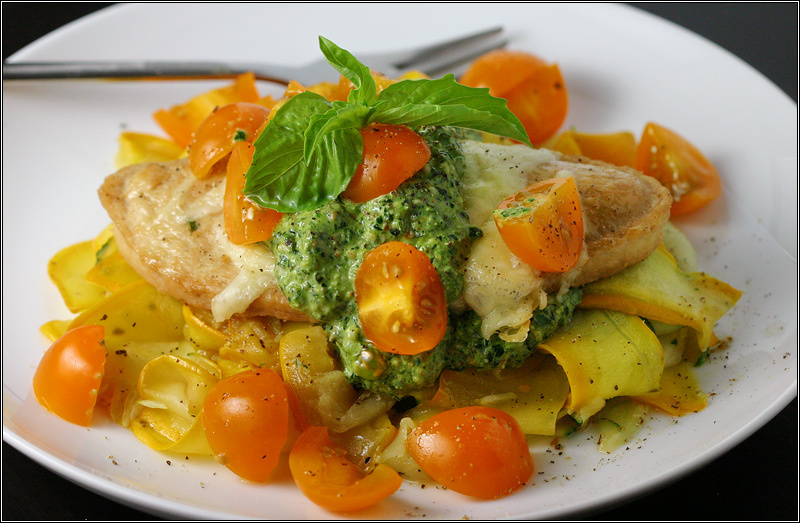 Serve topped with your creamy kale pesto and added protein of choice. Here I’ve eaten it with a braised Quorn cutlet and some halved cherry tomatoes. Caloric information is for zucchini noodles and sauce only. The addition of the Quorn cutlet, fontina cheese, and tomatoes brings it to around 313 per servings.